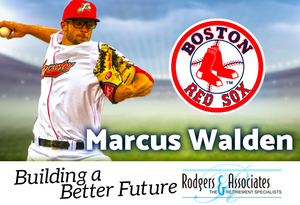 (Lancaster, Pa., March 28, 2018) - Marcus Walden, the Lancaster Barnstormers closer in 2015, has been placed on the Opening Day roster of the Boston Red Sox, it was announced in Boston yesterday. It will be the first time in the Major Leagues for Walden, 29. The opportunity comes in his 11th professional season and with his fifth organization. The Fresno, CA native appeared in 48 games for the Barnstormers in 2015 after joining the club in May. He was 2-4 with 15 saves and a 2.95 ERA. Once settled into the closing role during the Barnstormers’ second-half winning run, Walden set a franchise record by hurling 26 2/3 consecutive scoreless innings of relief. He signed with the Minnesota Twins the following off-season and split the 2016 campaign between Class AA Chattanooga and Class AAA Rochester. In 42 total appearances, the right-hander was 1-1 with six saves and a 2.40 ERA. Boston signed him as a minor league free agent last year. He was assigned to Class AAA Pawtucket, posting a 10-6 record and 3.92 ERA in a variety of roles. The performance was enough to earn Walden an invitation to spring training. He excelled at the Red Sox’s spring training camp in Florida, allowing only one earned run on six hits over 13 innings of work. Walden struck out 15. In making Boston’s 25-man roster, Walden becomes the 11th player in Barnstormers history to advance to the Major Leagues following his time in Lancaster and the fourth to make his big league debut after playing with the ‘Stormers. Six of those promotions have occurred since the beginning of the 2016 season. Boston opens its 2018 season on Thursday against the Tampa Bay Rays in Florida.